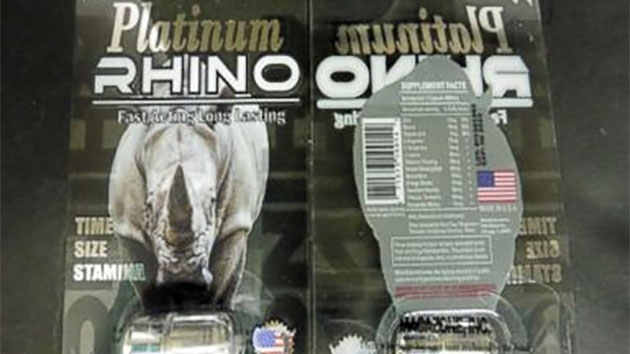 (WASHINGTON) — Users of Rhino male enhancement supplements are reporting health issues, such as chest pain and severe headaches, the U.S. Food and Drug Administration warned on Tuesday. Products with names such as Platinum Rhino 25000, Krazzy Rhino 25000 and Gold Rhino 25000 are unapproved FDA supplements that contain undeclared ingredients and are sold in gas stations, convenience stores and on websites such as Amazon, according to the FDA. The undeclared ingredients in these products are the same as or structurally similar to the active ingredients found in FDA-approved prescription drugs for treating erectile dysfunction such as sildenafil and tadalafil in Viagra and Cialis, the FDA said in its statement. The agency has also been investigating smuggled raw materials used to produce Rhino capsules since 2015. “Hidden active drug ingredients continue to be identified in products that are misrepresented as dietary supplements and promoted for sexual enhancement, weight loss, bodybuilding and/or pain relief,” the statement said. The FDA has received reports of chest pain, severe headaches, prolonged erection and hospitalizations due to extreme drops in blood pressure after taking a Rhino product. The agency encourages consumers who have experienced adverse health effect related to a dietary supplement to report it through the FDA’s MedWatch Safety Information program.